Answer: The Parable of the Prodigal Son is found in Luke chapter 15, verses 11-32. The main character in the parable, the forgiving father, whose character remains constant throughout the story, is a picture of God. In telling the story, Jesus identifies Himself with God in His loving attitude to the lost. The younger son symbolizes the lost (the tax collectors and sinners of that day, Luke 15:1), and the elder brother represents the self-righteous (the Pharisees and teachers of the law of that day, Luke 15:2). The major theme of this parable seems not to be so much the conversion of the sinner, as in the previous two parables of Luke 15, but rather the restoration of a believer into fellowship with the Father. 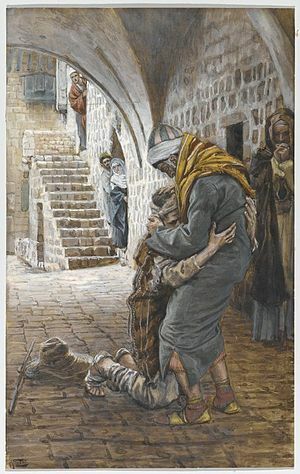 In the first two parables, the owner went out to look for what was lost (Luke 15:1-10), whereas in this story the father waits and watches eagerly for his son’s return. We see a progression through the three parables from the relationship of one in a hundred (Luke 15:1-7), to one in ten (Luke 15:8-10), to one in one (Luke 15:11-32), demonstrating God’s love for each individual and His personal attentiveness towards all humanity. We see in this story the graciousness of the father overshadowing the sinfulness of the son, as it is the memory of the father’s goodness that brings the prodigal son to repentance (Romans 2:4). In verse 13 we read that he travels to a distant country. It is evident from his previous actions that he had already made that journey in his heart, and the physical departure was a display of his willful disobedience to all the goodness his father had offered (Proverbs 27:19; Matthew 6:21; 12:34). In the process, he squanders all his father had worked so hard for on selfish, shallow fulfillment, losing everything. His financial disaster is followed by a natural disaster in the form of a famine, which he failed to plan for (Genesis 41:33-36). At this point he sells himself into physical slavery to a Gentile and finds himself feeding pigs, a detestable job to the Jewish people (Leviticus 11:7; Deuteronomy 14:8; Isaiah 65:4; 66:17). Needless to say, he must have been incredibly desperate at that point to willingly enter into such a loathsome position. And what an irony that his choices led him to a position in which he had no choice but to work, and for a stranger at that, doing the very things he refused to do for his father. To top it off, he apparently was paid so little that he longed to eat the pig’s food. Just when he must have thought life could not get any worse, he couldn’t even find mercy among the people. Apparently, once his wealth was gone, so were his friends. The text clearly says, “No one gave him anything” (vs. 16). Even these unclean animals seemed to be better off than he was at this point. This is a picture of the state of the lost sinner or a rebellious Christian who has returned to a life of slavery to sin (2 Peter 2:19-21). It is a picture of what sin really does in a person’s life when he rejects the Father’s will (Hebrews 12:1; Acts 8:23). “Sin always promises more than it gives, takes you further than you wanted to go, and leaves you worse off than you were before.” Sin promises freedom but brings slavery (John 6:23). This prodigal son was satisfied to return home as a slave, but to his surprise and delight is restored back into the full privilege of being his father’s son. He had been transformed from a state of destitution to complete restoration. That is what God’s grace does for a penitent sinner (Psalm 40:2; 103:4). Not only are we forgiven, but we receive a spirit of sonship as His children, heirs of God and co-heirs with Christ, of His incomparable riches (Romans 8:16-17; Ephesians 1:18-19). The father then orders the servants to bring the best robe, no doubt one of his own (a sign of dignity and honor, proof of the prodigal’s acceptance back into the family), a ring for the son’s hand (a sign of authority and sonship) and sandals for his feet (a sign of not being a servant, as servants did not wear shoes—or, for that matter, rings or expensive clothing, vs.22). All these things represent what we receive in Christ upon salvation: the robe of the Redeemer’s righteousness (Isaiah 61:10), the privilege of partaking of the Spirit of adoption (Ephesians 1:5), and feet fitted with the readiness that comes from the gospel of peace, prepared to walk in the ways of holiness (Ephesians 6:15). A fattened calf is prepared, and a party is held (notice that blood was shed = atonement for sin, Hebrews 9:22). Fatted calves in those times were saved for special occasions such as the Day of Atonement (Leviticus 23:26-32). This was not just any party; it was a rare and complete celebration. Had the boy been dealt with according to the Law, there would have been a funeral, not a celebration. “The Lord does not treat us as our sins deserve or repay us according to our iniquities. For as high as the heavens are above the earth, so great is his love for those who fear him; as far as the east is from the west, so far has he removed our transgressions from us. As a father has compassion on his children, so the Lord has compassion on those who fear him.” (Psalm 103:10-13). Instead of condemnation, there is rejoicing for a son who had been dead but now is alive, who once was lost but now is found (Romans 8:1; John 5:24). Note the parallel between “dead” and “alive” and “lost” and “found”—terms that also apply to one’s state before and after conversion to Christ (Ephesians 2:1-5). This is a picture of what occurs in heaven over one repentant sinner (Luke 10). The older brother’s focus was on himself, and as a result there is no joy in his brother’s arrival home. He is so consumed with issues of justice and equity that he fails to see the value of his brother’s repentance and return. He fails to realize that “anyone who claims to be in the light but hates his brother is still in the darkness. Whoever loves his brother lives in the light, and there is nothing in him to make him stumble. But whoever hates his brother is in the darkness; he does not know where he is going, because the darkness has blinded him” (1 John 2:9-11). The older brother allows anger to take root in his heart to the point that he is unable to show compassion towards his brother, and, for that matter he is unable to forgive the perceived sin of his father against him (Genesis 4:5-8). He prefers to nurse his anger rather than enjoy fellowship with his father, brother and the community. He chooses suffering and isolation over restoration and reconciliation (Matthew 5:24; 6:14-15). He sees his brother’s return as a threat to his own inheritance. After all, why should he have to share his portion with a brother who has squandered his? And why hadn’t his father rejoiced in his presence through his faithful years of service? The wise father seeks to bring restoration by pointing out that all he has is and has always been available for the asking to his obedient son, as it was his portion of the inheritance since the time of the allotment. The older son never utilized the blessings at his disposal (Galatians 5:22; 2 Peter 1:5-8). This is similar to the Pharisees with their religion of good works. They hoped to earn blessings from God and in their obedience merit eternal life (Romans 9:31-33; 10:3). They failed to understand the grace of God and failed to comprehend the meaning of forgiveness. It was, therefore, not what they did that became a stumbling block to their growth but rather what they did not do which alienated them from God (Matthew 23:23-24; Romans 10:4). They were irate when Jesus was receiving and forgiving “unholy” people, failing to see their own need for a Savior. We do not know how this story ended for the oldest son, but we do know that the Pharisees continued to oppose Jesus and separate themselves from His followers. Despite the father’s pleading for them to “come in,” they refused and were the ones who instigated the arrest and crucifixion of Jesus Christ (Matthew 26:59). A tragic ending to a story filled with such hope, mercy, joy, and forgiveness. Recommended Resource: Parables of Jesus by James Montgomery Boice. This entry was posted in Discipleship and tagged Christ Jesus, Father, God, Gospel of Luke, Jesu, Jesus Christ, Luke, New Testament, Parable, Pharisee, Prodigal Son Parable, theology. Bookmark the permalink.